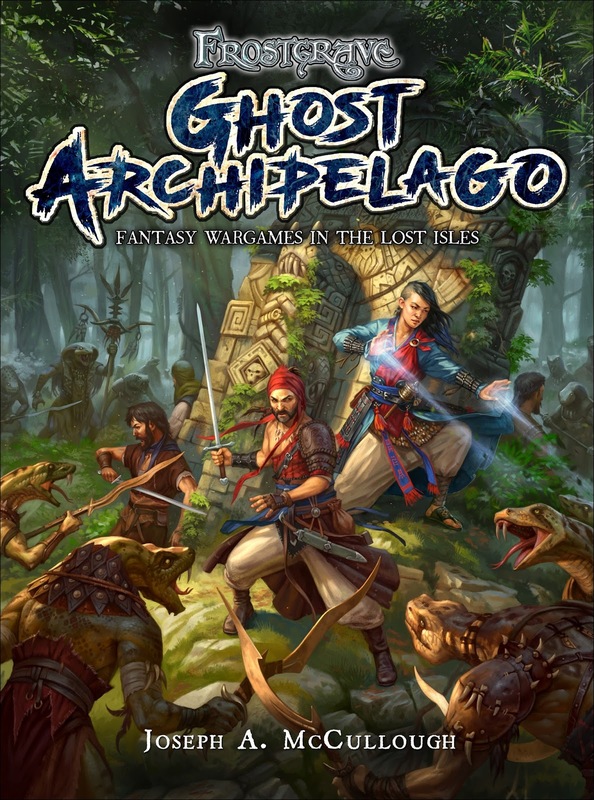 Today I am allowed to show off the cover for Frostgrave: Ghost Archipelago! Once again, the artwork comes from the talented Dmitry Burmak, who did all of the artwork in the original Frostgrave book. For this project, he is being joined by his wife, Kate. One other piece of news that I'm allowed to reveal, Osprey Games and North Star Military Figures are once again working together to produce miniatures for the game. This will include a plastic box set of 'crew' figures that will make up the bulk of the Heritor's crew. This will hopefully be released at the same time as the book, in September. Or see my previous post on Ghost Archipelago if you have no idea what I'm talking about! According to my parents, I was not a child that took to reading. They tried a lot of tactics to get me interested in books, before finally finding some success with comic books. Even then, I have remained a slow reader, who occasionally struggles with word order and spellings. However, what I have lacked in natural speed, I have made up for with determination, and now I list reading as my favoured pastime. Lately though, I have been dissatisfied with my reading. Too often, I think, I have picked up books because they just happened to be in front of me, or because, in my laziness, I fell back upon some comfortable genre, instead of choosing my books with careful intelligence. Lately, I have found no challenge in the books I’ve read. I had been having these thoughts a lot as last year came to an end. Then, by happenstance, I found myself in a small charity bookshop in my wife’s hometown. Upon the shelf, I saw a small red volume entitled Sesame and Lillies by John Ruskin. I knew of Ruskin more by reputation than acquaintance, having read only a single lecture by him, but I find him an intriguing figure. He spoke a lot about art and its relationship to society. One of the interesting things about buying really old books is that they do not have blurbs. This book was old enough that it contained no information at all on when it was printed. So, knowing nothing but the author, I turned over £1 to the man at the counter and took my new book home. It is by sheer coincidence that the first two lectures (of the three in the book) are about ‘what to read’. In truth, that topic is just a launching point to wander over a variety of ideas, but it still struck me as a very strange coincidence. No book is worth anything which is not worth much; nor is it serviceable, until it has been read, and re-read, and loved, and loved again; and marked, so that you can refer to the passages you want in it, as a soldier can seize the weapon he needs in an armoury, or a housewife bring the spice she needs from her store. That to use books rightly, was to go to them for help: to appeal to them, when our knowledge and power of thought failed; to be led by them into the wider sight, purer conception than our own and receive from them the united sentence of the judges and councils of all time, against our solitary and unstable opinion. So, my goal for this year is to challenge myself with my reading, to actively seek out books that contain wisdom or that will challenge my thinking. I will still read science-fiction, fantasy, and adventure fiction, but only if I have strong reason to believe those works to be above average (why bother reading the average?). We shall see how I get on. I have had a very off-and-on relationship with Games Workshop throughout my life. At times they have been my favourite games company, at other times their business decisions have driven me to despair. At the moment, they seem to be going through a bit of a 'renaissance', and are even, once again, producing a few Middle-Earth miniatures, which forms my main interest in their products these days. Phil did a full write-up of the exhibition on his blog, complete with some photos of some of the cooler displays. You can see it here. Really, if you are a sci-fi/fantasy miniatures fan, and you get the chance - go. 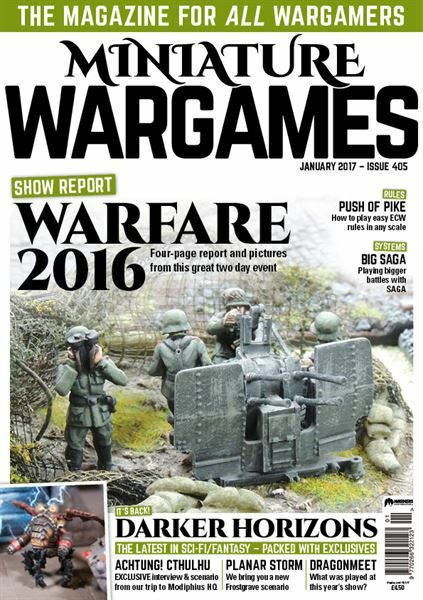 I just received the new issue of Miniature Wargames which includes my new Frostgrave scenario, 'Planar Storm'. This scenario was written to go along with the ones found in Forgotten Pacts, and features a new type of barbarian adversary, 'The Tainted'. Miniature Wargames 405 is available in either print or ebook editions. I haven't had a chance to read the rest of the issue, but it appears to contain some interesting stuff, such as a solo scenario for The Men Who Would Be Kings by Conrad Kinch, an article from the Andy Copestake who runs Old Glory UK on what influences him as a gamer, and a full set of pike and shot rules by Arthur Harman. Although my new, ultra-bright painting set-up has really made a difference to my vision, it unfortunately hasn't created any time to actually pick up a paint brush. Still, sometime in the past few weeks I managed to finish one figure, this 'Clansman of Lamedon' from Games Workshop's The Lord of the Rings line. It's a bit of a curious figure. While I love the sculpting and the pose, it doesn't fit that well into my personal vision of Middle-Earth. Although Lamedon is one of the provinces of Gondor mentioned by Tolkien, he doesn't say that much about it. I don't think there is any reason beyond simple geography to assume they fight and dress like Scottish Highlanders. Still, designers have to design something, and when they have little-to-nothing to go on, they must draw upon other sources. Before I started painting this figure, I spent a couple of days agonising over what tartan to paint his kilt, as every other version I had seen painted had some form of tartan. Then, I said, 'heck with it', and decided to forgo the whole idea of a tartan, or highlanders. I'd just paint it in colours I liked. Well, I think the result is pretty striking. The heavy armour, the skirt, and the grieves, combined with my paint job makes the figure look more like an ancient Greek than a Scot; which is fine by me. The only aspect of the figure I wasn't happy with was the face. It just wasn't working for me, so I painted a beard on it. 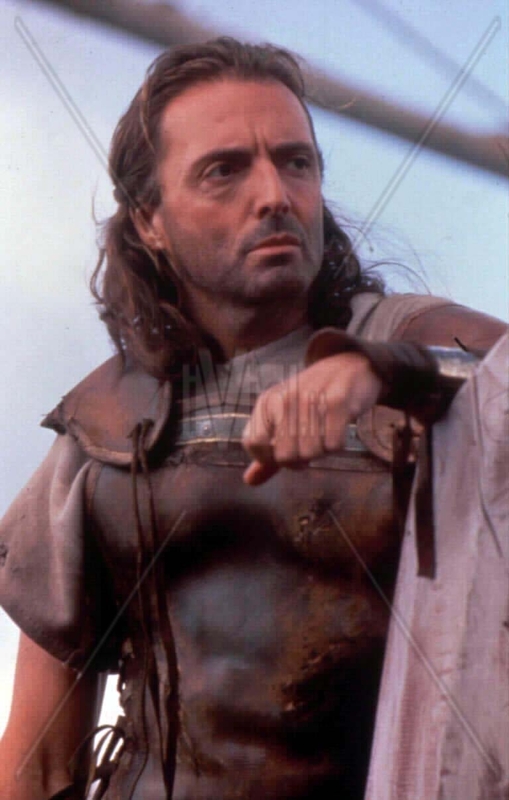 Now the figure reminds me a bit of Armand Assante in his roles as Odysseus and Alan Breck Stewart (in perhaps the best television version of Kidnapped!). The figure came in a pack of three, so now I have to decide whether to paint them all in this colour scheme, or to give each one a unique dress.